Listen and order now from Amazon, iTunes, and all major retailers and digital outlets. This world premiere recording contains works by American composers that Nakura commissioned as part of a recital series under the theme ofWood and Forest. Pieces include After the Forest Fire for marimba, flute and cello by Michael Torke, Winik/Te' for solo marimba by Carlos Sanchez-Gutierrez, Forest Shadows for solo marimba by Robert Paterson, Duo for vibraphone and viola: From the Verdant Kingdom by Kenji Bunch and two works by Jacob Bancks, Arbor una nobilis for marimba and violin and Where I Was Born: Two Pieces for Marimba After Walt Whitman. 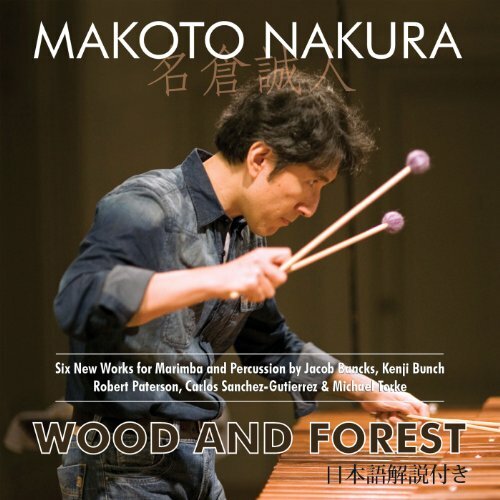 Makoto created this album because he thinks it is only natural to play pieces about wood and forest on the marimba. Each composer was inspired by different ideas relating to these themes. For instance, a Mayan mythology, paintings of forest by French and German painters and Whitman’s poem about the trees in the South, and so on. For Bunch’s duo, the composer wrote for the world biggest vibraphone which is only available in Japan. This is the tirst recording of that instrument. The performer collaborators for Wood and Forest include Jesse Mills on violin, Kenji Bunch on viola, Wilhelmina Smith on cello, and flutist David Fedele. All of the pieces on this album are world premiere recordings commissioned by the ISGM New Music Commissioning Fund for Makoto Nakura. Click to Download Bio and Program Notes in Japanese. The Trees Where I Was Born – Two Pieces for Marimba After Walt Whitman (2011) by Jacob Bancks is a three-movement meditation on the poetic imagery in Walt Whitman’s ode to the American South, O Magnet-South. Duo for vibraphone and viola: From the Verdant Kingdom (2009) by Kenji Bunch, the only work on the album for vibraphone, is a three movement work with the titles Night, Dawn and Birds. This is the first recording in the world of this vibraphone, which is one of the world's largest vibraphones. Forest Shadows (2011) for solo marimba by Robert Paterson, a composer and percussionist, is inspired by nature scenes by nineteenth-century French painters such as Theodore Rousseau and landscape painters like Caspar David Friedrich. Arbor Una Nobilis (“Noblest of trees”) (2009) for marimba and violin, also by Jacob Bancks, is based on the chant Crux fiddles, an ancient hymn for Good Friday. After the Forest Fire (2005) for marimba, flute and cello by Michael Torke is inspired by the title's theme, and is the only trio on the album.